Comet 250 – ultra compact die cutter with great efficiency. exceedingly compact design. Perfect for companies wishing to start-up a label business as well as anyone, who would like to produce labels for individual purposes. super fast machine, working at a speed up to 100m/min. Equipped in one rotary die cut unit with a magnetic cylinder and flexible dies. Comet is user-friendly, easy to operate and does not require any experience. One hour of training is sufficient enough to become an operator of a professional rotary die cutter! 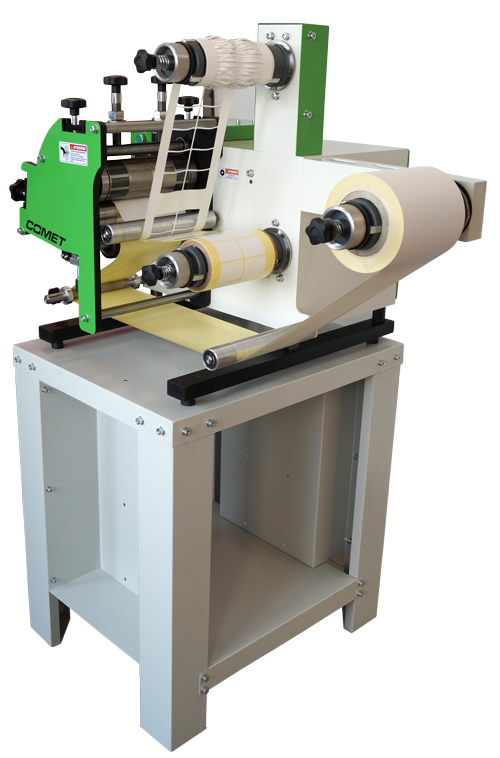 The Comet Series are machines perfect solution for the production of basic, blank labels, by utilizing a heavy-duty rotary, magnetic cylinder and replaceable dies. 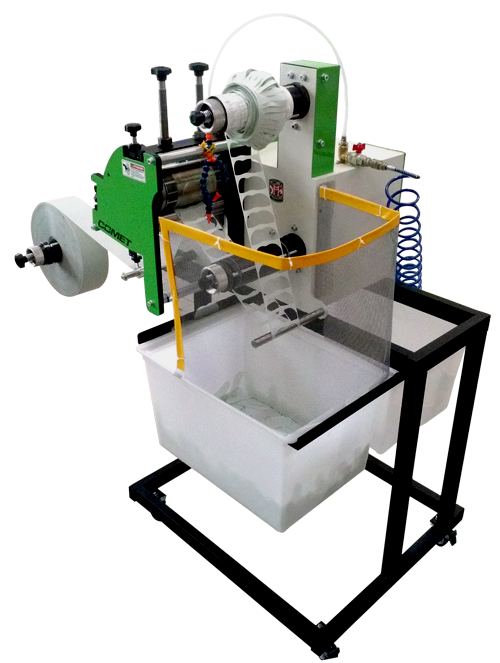 One die station combined with two rewinders in a compact solution, have been installed in this innovative machine. A precise roll-length measurement system, programed with an automatic stop, is a result of implementing a powerful AC sealed motor, which is controlled by maintenance-free Invert. The heavy-duty rotary die cutting system is highly reliable and durable, will operate for many decades, at minimal maintenance costs. Its compact design is perfectly suitable for any office space. This indicates that your company will have the ability to manufacture labels for individual purposes, eliminating any subcontracting costs due to the process of cutting out labels. Our machines will enable you to save your time and money. Only one, earlier trained person is required to operate the machine. Comet works perfectly in the production of labels for thermal transfer printers. The top quality of the workmanship and manufactured using only the best materials, guarantees that the machine will operate reliably for many years. The machine is entirely manufactured in Italy, using only European raw materials. What kind of applications can I produce using my Comet? Despite its small size, Comet works at a fairly impressive opera-ting speed up to 100m/min. 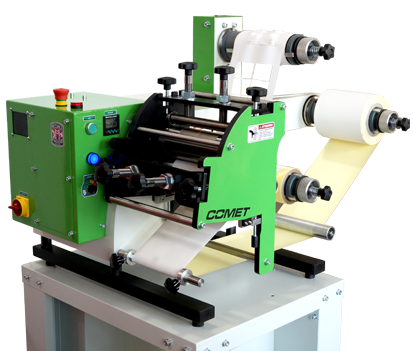 Comet can be adjusted to cutting units, which allows manufacturing labels as well as tags for example; Comet enables punching label shapes such as lids. The machine is delivered together with a solid base a table, consisting of a holder for 10 magnetic cylinders.